Who Is The Real Foreigner? So who's the real foreigner? Have you ever noticed that in just about any ESL context, someone is the foreigner? Continue reading "Who Is The Real Foreigner?" In many resorts in warm climates, one of the options is to swim with the dolphins. This is sort of like running with the bulls in Pamplona, Spain - except much safer - and in water. Continue reading "Swimming with the Dolphins"
Thank you for taking the time the July issue of the ESL Instruct newsletter! This entire blog entry has been set aside specifically for that purpose. If you would like to provide feedback on the July edition of ESL Instruct, then please do so here . . .
Continue reading "Comments & Feedback on ESL Instruct, July 2006"
Thank you for taking the time the March issue of the ESL Instruct newsletter! This entire blog entry has been set aside specifically for that purpose. If you would like to provide feedback on the March edition of ESL Instruct, then please do so here . . .
Continue reading "Comments & Feedback on ESL Instruct, March 2006"
This entire blog entry has been set aside specifically for remarks about the newsletter. If you would like to provide feedback on the February edition of ESL Instruct, then please do so here . 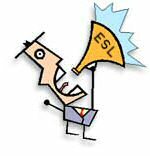 . .
Continue reading "Comments & Feedback on ESL Instruct, February 2006"
Michelle and I both invite you to comment on the newest edition of ESL Instruct for 2006 which we co-authored. This entire blog entry has been set aside specifically for that purpose. If you would like to provide feedback on the January edition of ESL Instruct, then please do so here . . .
Continue reading "Comments & Feedback on ESL Instruct, January 2006"
Continue reading "Comments on "ESL Instruct" - December"
Continue reading "Comments on "ESL Instruct" - November"
Thanks for taking the time out of your already busy schedule to provide feedback on the most recent edition of ESL Instruct. Continue reading "Comments on "ESL Instruct" - October"
Continue reading "September 2005 ESL Instruct Feedback and Comments"
Thanks for visiting my site! I'd like to hear your comments and feedback on the ESL Instruct newsletter. Please let me know what you think hereand thanks for visiting. I wanted to take a moment and talk about the ESL job postings, and explain the role that we play in helping you in your job search. I have been getting so many questions from readers who send me their resumes, or asked me to help them get "in" with a company, or help them find a job. But that's not the role of the job board. Continue reading "Job Board Tips"
Thanks for visiting my site! I'd like to hear your comments and feedback on the ESL Instruct newsletter. Please let me know what you think here and thanks for visiting. Wow! You guys really are reading this! I was thrilled to see all of the responses to our survey about this blog and the newsletter. Thank you for all of your kind comments--I'll be getting to all of them soon and post them for everyone to see. "A serious suggestion that I consider to be of great importance in ESL around the world would be to bring the ethical responsibilities of the educational professional to the attention of prospective teachers. Your presentation in particular is going to appeal to the hedonist in us all, so a reminder of the professional commitment necessary to prevent the EFL / ESL industry (from) becoming more exploitative might be appropriate. This applies more and more the further job opportunities get away from our strict and stressful home countries ... There is often no idea of standards of English or professional responsibility once away from Europe and America. The poor peoples of the world need good, honest English teachers who care about the progress of students and their communities as much as their own income and lifestyle." Continue reading "Wow! You guys really are reading this!"